Check out our new Blog, link on the main menu bar. 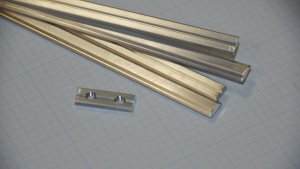 Latest Post: Advanced nut plate machine. MicroRAX is a light weight mini T-Slot style building system. Suitable for use on your desktop or bench top to build science, engineering, or advanced hobby and DIY projects. 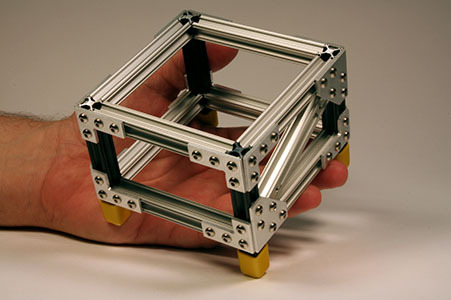 This small rugged framing system is ideal for use in machines, school science projects, robotics, design houses, workshops, prototypes, repair, models, gadgets, maintenance, etc. We're in Makezine! #28 "Coffee Table MAME Console"
MicroRAX works like larger structural framing with unique dovetail slots running down the length. Joining plates engage nuts that fit into the slots allowing for placement along the length of the profile. You can make just about any configuration imaginable. Made from high-strength precision extruded aluminum (6063-T6), MicroRAX is much stronger than plastic building systems or thin punched sheet metal. MicroRAX fills the gap between large, heavy steel or aluminum structural systems and toy building systems. Professionals can make smaller structures with the integrity they are familiar with. While advanced hobbyists can build more permanent projects that will stay together. MicroRAX is "green" too, by following the three R's; Reduce, Reuse, Recycle! 1. Smaller so you use less material. 2. Easy to take apart for reuse. 3. Made from aluminum which is 100% recyclable. 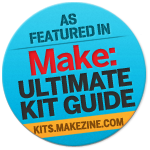 MicroRAX is featured on page 49 of the Make: Ulitimate Kit Guide. Please explore our site and find out everything you can about MicroRAX. Call us for any reason toll free at 1-800-979-9645, M-F 9:00am to 4:00pm Pacific time.